EDIT 21/05/17: A lot of the information and links in this post are now out-of-date, so don't take them as gospel! Order thread with updated info coming soon! 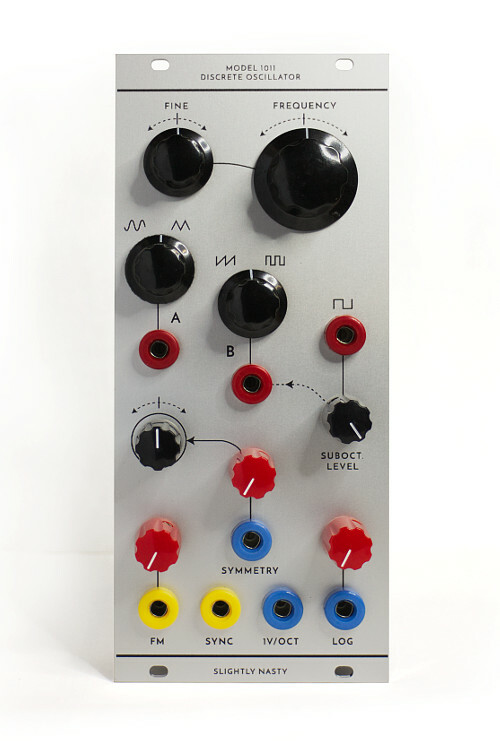 All of these modules will eventually be released, but the first one off the rank is the Model 1011 Discrete Oscillator. It's a full-featured, temperature compensated sawtooth-core VCO built with nothing but 41 discrete transistors and a small army of passive components. There's 1V/Oct, Log FM, Lin FM, Sync and Symmetry (PWM) inputs, and three outputs. Output A is crossfade-able between sine and triangle, Output B crossfades between saw and pulse, with the ability to mix in suboctave as well. The third output is the raw suboctave. Tracking I'll tentatively describe as "fairly good", I haven't done a proper analysis of it since the very early stages of development, but I've always intended this to be a good oscillator for melodic and pitched stuff, hence the temperature and high-frequency compensation. I'll try to put together some decent demos of it performing melodic lines soon. Cost will be $22 USD for the PCBs, $30 USD for the front panels. Postage will be about $4 USD within Australia and $7 USD overseas. 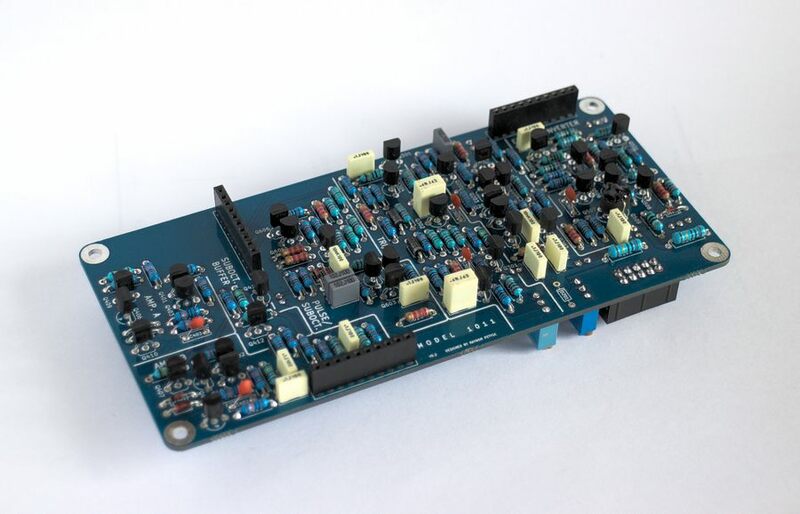 PCBs are dual-layer HASL finish with blue silkscreen, the panels are CNC routed from 2.5mm satin anodised aluminium and multi-pass UV printed, by an Australian company that specialises in subrack hardware. I'm keeping this an interest check as opposed to an order thread for the moment as I haven't yet ordered the latest versions of the PCBs, and I don't want to take anyone's hard-earned dineros until I've got the stuff ready to ship out. So let me know if you're seriously up for a set and we'll make this thing happen! - Model 1011 Discrete Oscillator. - Model 1011 Discrete Oscillator (early prototype). - Model 1411 Dual Discrete Mixer. - Model 2111 Random Voltage Source. - Model 2251 Multiband Filter. 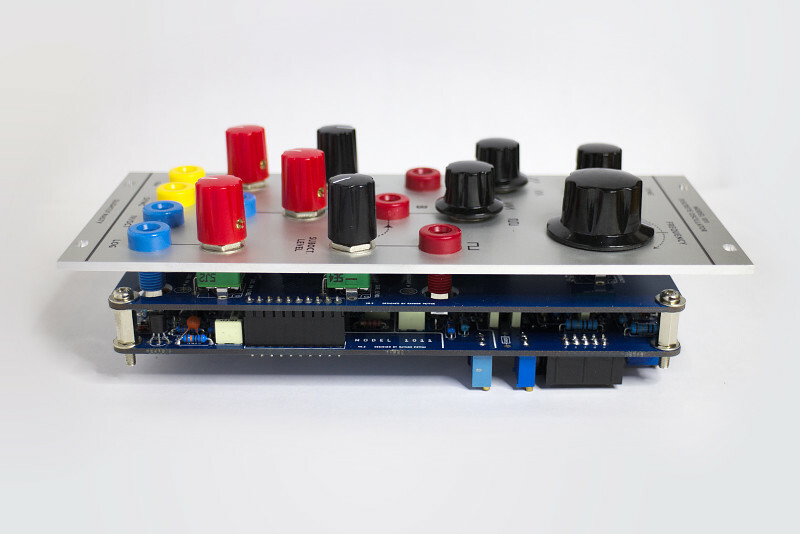 The 2231 Asymmetric Slew Limiter (a versatile voltage-controlled function generator in the Serge USG / Buchla 281 vein) will likely be the next release. That documentation is incredible! This is exciting for sure. May I suggest a multi-format power input for those of us not using Euro ribbon cables (yuck )? Something like what other manufacturers use for Euro/Serge/5u compatibility would be the icing on the cake. ill probably will buy kits for sure when available. nice one! these look great. i'm really sold on discrete designs (from the few i've built). i agree, please add mta 156 power option. i'm not keen on euro-style power cables. i imagine most 4u builders would feel the same. I will certainly buy at least one when they're ready. Fantastic stuff! 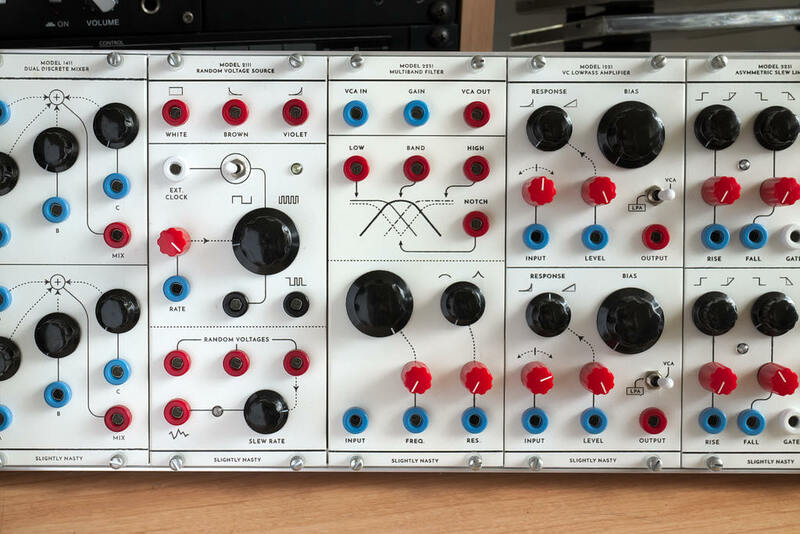 Totally dig the fact that you did a discrete VCO (TO92 fetish), and that graphical design of both the frontpanel and build doc looks great, really like the style. I have enough VCOs...I know, never say enough, but, if I count...it would be around 15-16, which is fully enough for a Buchla system. But, I'm in for 2 sets of the LPGs! I love the detailed information provided. 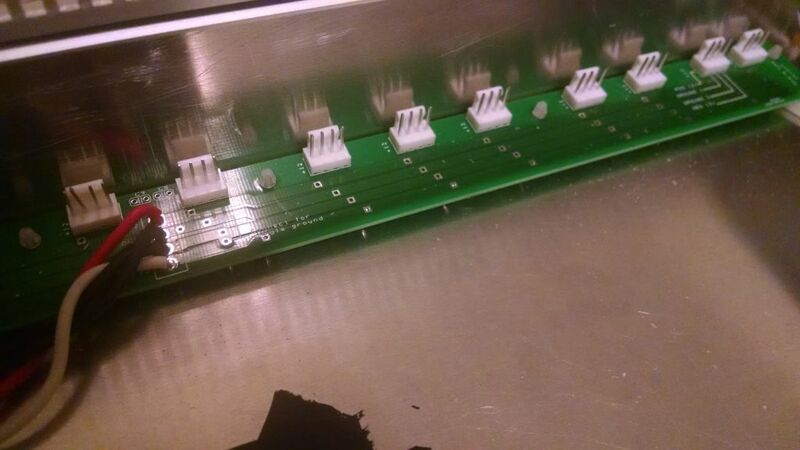 No voltage control of the crossfaders? Kidding... It's looking very nice. Excellent write up too. I'm just back from 'no-internet-land' and have not been here for a bit, thinking "what have I missed?" Well, glad I didn't miss this, would deffo have 2 or so! Add me to the interested list! This is awesome. So pleased to see the 4u format grow. This is too cool for school. What are the chances of getting the panels in white (like your OP photo) instead of aluminium..? This is looking really excellent!! Steller documentation! I'm interested in 2. May I suggest a multi-format power input for those of us not using Euro ribbon cables (yuck )? Something like what other manufacturers use for Euro/Serge/5u compatibility would be the icing on the cake. I'm working on a 4U LW boat. This will be the power distro, so a 4 pin .156" would be nice (though the distro end would be .100"). Ribbon cable for power isn't really ideal. These look really great! The panel mounting using the knobs with holes for the bananas is the way I'm going too. I agree with others that some kind of power combo footprint with the 0.156 on there too would broaden the appeal further. There is a pretty decent combo footprint that I've seen on a few DIY boards. I'm not sure who originally came up with it, but it seems like a good option for having ribbon and .156 connectors without using any additional space. Mm. I suspected the IDC connector might be contentious. I'll have a look at getting an MTA-156 on there as well, it might require a little bit of shuffling around but nothing too major. Personally I rather like the ribbon connectors, they might not be the best option out there but I think they're the most convenient. Being able to whip up a power cable in less than a minute appeals to my impatient nature. I did agonise over that. In the end I decided that the lower price (satin anodised aluminium is a standard finish) and visual conformity with other 4U panel makers like Charlie was the wiser choice. Unfortunately the up-front production cost is quite substantial on the panels, so it's difficult for me to offer two options at this point.